Yesterday I deconstructed our old hide-a-bed which had been taking up space in one of our sheds. It took 2-3 hours, mostly pulling the hundreds of staples that held the fabric and foam to the wood substructure. 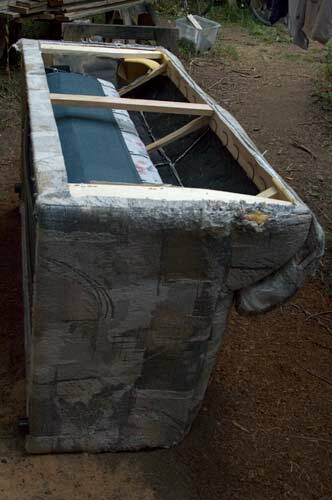 Only four screws in the whole unit; they held the metal folding bed frame to the wood. I think most of the weight of hide-a-beds is in the metal frame and the staples. I listened to music via my iPod while taking it apart but random thoughts passed through my mind also. I remembered the strange obsessive behaviour of a neighbour from almost 40 years ago. I was young, freshly married and my then-wife was pregnant with our first child. We lived downstairs from her sister and sister’s boyfriend. We had access to the basement but I don’t remember using it for much, except sometimes we’d check out what the neighbour was up to. He and his mother lived together in a formidably immaculate house and gardens. He was probably about 50ish. We knew they were obsessive about their garden as they had green painted thin spikes in their shrubs. If a dog were to lift its leg to pee on a shrub it would get a sharp warning not to be so bold. From the basement window we could watch the son deconstruct couches he’d brought home. He must have obtained them at garage sales or thrift stores. He would take them apart and carefully cut all the fabric into 3 or 4 inch squares. All the wood and metal parts would be cut into short pieces. 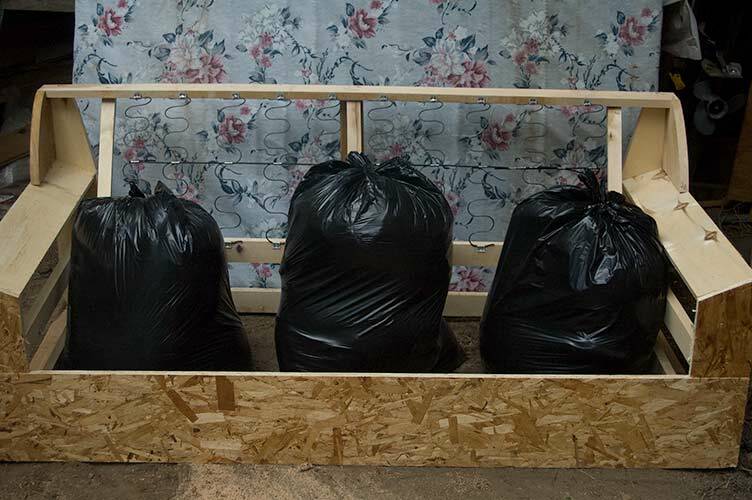 As he took the couches apart and cut them up he’d bag everything: metal in one bag, fabric into another etc. There is something fascinating about deconstruction. I didn’t really enjoy pulling the hundreds of staples out of the hide-a-bed; it was rather tedious and annoying really. But cutting the fabric was kind of cool. It made me think of customs agents at the border cutting into people’s cars searching for contraband. All very destructive. Or, to put it in more user-friendly terms: deconstructive. I’ve a long history of deconstruction. As a child, a small boy, I loved toy guns. For Christmas 1959 my parents gave me a machine gun mounted on a tripod. Very cool. But within a year I’d taken it apart to see how it worked. I don’t recall getting into trouble for that. I must have though when I took the card table apart around that same Christmas. And I know I did when a friend and I finished deconstructing a small greenhouse at the house we rented. Several panes had broken in a storm and we took the rest out in an attempt to break the corners off diagonally. Probably not a safe project for a six year old. Deconstruction projects seem to have been more successful for me than reconstruction projects. In Grade 9 Power Mechanics I just could not get the lawn mower engine back together and working until about the fourth try. First I got the pistons in the wrong way, then forgot to put oil in. Mechanical aptitude eludes me. Although I can now take the shrouding off our scooter and put it back on again with no left over screws. However, I still can’t figure out why it’s running rough. Recently I took apart a slide projector. The bulb was gone and they’re hard to find now. Plus I have 3 others, one of which I actually use once every few years when I need to look at some slides. Mainly I wanted the lens and to see what else might be reusable. But also there’s a quiet pleasure in easily removed screws. One after another. Much more satisfying than pulling staples. 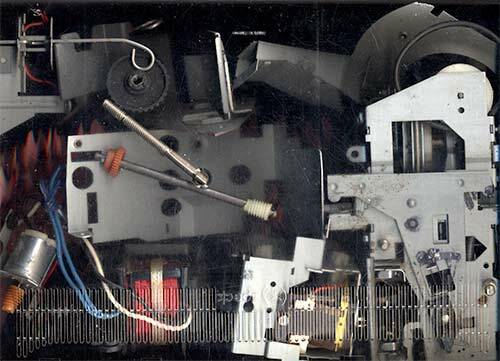 One of my favourite deconstructions was in the 80s I found several old teletype machines in a dumpster. I took one apart and used bits of it for a sculpture. I kept the keys for ages, thinking they’d make interesting earrings but never did get around to that project. Although I haven’t done it for a few years I used to like taking my mountain bike apart. There’s something very beautiful about a bike frame on it’s own. I always put it back together though. I suppose that provided some redemption for not being good with power mechanics. Tomorrow we’re taking the junked bits of the hide-a-bed to the dump. The metal frame will go to recycling. The wood frame I’m still undecided about. It may become an armature for a sculpture. It may become firewood, although that seems plain destructive. After all: someone put time into cutting and assembling it. I remember listening to an American artist talk about how she’d built a concrete base for a mall sign and had embedded old appliances, like toasters, in it. She said people were really upset that she would abuse appliances that way. Even though they didn’t work people still thought they had value. Me, I’d take ’em apart and photograph them. Then off the bits would go to recycling or, if there’s room, into a shed for future projects. Sue’s 1964 Pontiac Laurentian is still sitting out front on blocks. What to do? What to do?